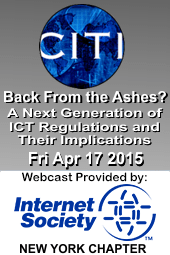 April 17th 2015 9:00am-5:30pm the Columbia Institute for Tele-Information, in collaboration with the International Telecommunications Society, presents Back From the Ashes? A Next Generation of ICT Regulations and Their Implications at Columbia University NYC. This Event/Workshop will cover the various regulatory aspects of emerging next generation technology in the Information and Communications Technology (ICT) sector. With the recent decision by the Federal Communications Commission (FCC) rules on Open Internet or “Net Neutrality,” the role of regulation in the ICT sector has once again been highlighted. The ICT sector continues to undergo significant changes: OTT services are proliferating; Google is pushing into the wireless sector and deploying fiber in selected communities; the ubiquity of WiFi is encroaching on data services offered by traditional cellular providers and some firms are attempting to displace the voice cellular services with a network of WiFi. A series of panels will examine the ICT policy implications. The event will be webcast live via the Internet Society livestream channel.